Construction workers face dangerous conditions on a routine basis. Many are injured on the job, and some suffer debilitating or fatal harm. If you work at a construction site and were hurt there, you may be able to receive benefits. The workers’ compensation attorneys at Pulgini & Norton represent individuals injured in a wide range of workplace accidents. We have more than 40 years of combined experience handling these types of cases. A Boston construction accident lawyer can help you navigate the workers’ compensation system in Massachusetts and assert your right to the benefits you may be entitled to receive. Building sites present workers with dangerous conditions. Scaffolding, cranes, ladders, trenches, hazardous chemicals, and faulty wiring are just some types of hazards that could threaten their safety. Serious accidents can occur at construction sites, and workers can also suffer fatal injuries. According to 2012 data from the U.S. Department of Labor, more than 19 percent of work-related deaths in the private sector were in this industry. Most of these tragic events were the result of falls, being struck by an object, or electrocutions. If you are a construction employee and were hurt on the job, you may be eligible for workers’ compensation benefits. This state-operated system provides coverage for medical care, reimbursement for lost income, and other benefits to individuals who suffer work-related injuries or illnesses. Construction site accidents are often fatal, and relatives of a deceased worker can also try to recover benefits through workers’ compensation. Temporary total disability, which is when you are temporarily unable to work. To receive workers’ compensation, you need to meet certain eligibility requirements. You must be able to connect your injury or illness to your work. You must also miss a minimum of five days at your job as a result of the accident. You will need to report your injury to your employer and its insurer. Few workers’ compensation claims, however, are approved without any challenges. Most injured employees face hurdles when they apply for benefits. Your employer’s insurer may deny your claim if it believes that your accident was not work-related. It may also disagree with the type of medical treatment you need or argue that your injury is not as severe as you say. Filing thorough medical records and other relevant documents will strengthen your case for the benefits you need. If your claim is denied, you will need to appeal to the Department of Industrial Accidents. Our attorneys can meticulously prepare your workers’ compensation claim and appeal any denials. 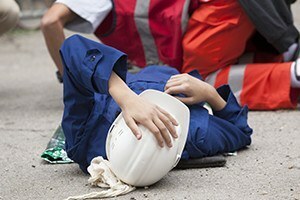 Construction site accidents may be caused by someone other than or in addition to your employer. An architect, engineer, general contractor, or sub-contractor may be responsible for your injury. If a third-party caused your harm, you can bring a lawsuit against that person or entity. You would need to prove that its negligence resulted in your injuries. In this situation, it is important to act promptly to gather evidence of a third party’s careless conduct, since conditions on construction sites change virtually on a daily basis. We can help you act quickly to take legal action. At Pulgini & Norton, we offer seasoned and dedicated representation to workers hurt on construction sites. Our workplace accident lawyers can help you seek the workers’ compensation benefits you need for your injuries. Whether you need assistance with the initial filing or an appeal, we can prepare the necessary documents and represent you at every step of the claims process. If a third party is also responsible for your injuries, a Boston construction accident attorney can help you pursue a lawsuit for damages. We serve clients in Lowell, Quincy, and Waltham, among other communities. Call our office at 781-843-2200 for a consultation. You can also complete our online form.